Millions of tyres are replaced each year, so it may seem a simple task… BUT, it can and has caused serious injury and death! Inflated tyres on a commercial vehicle has over 34 tonnes of force acting upon it. 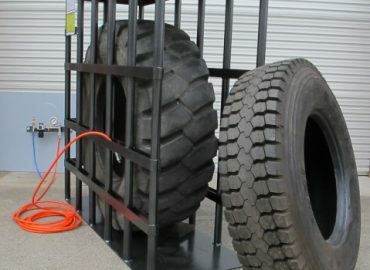 Tyres are designed to withstand this force, but if they’re damaged in anyway, they may fail!… this force is then released explosively, resulting in a destructive air blast and the ejection of high-speed particles. If the wheel is not restrained, it and rim components can fly metres through the air. 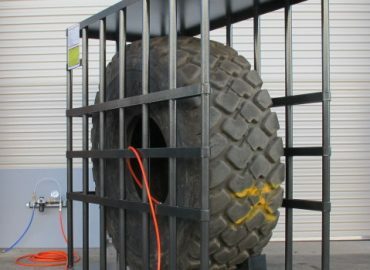 The use of a certified tyre safety inflation cage could have prevented these! 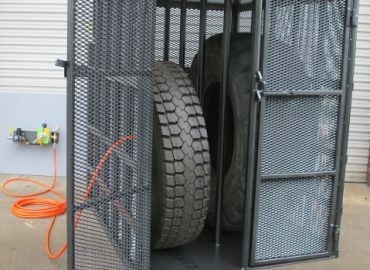 In 1996 RLM were asked by industry peers to develop a Tyre Safety Inflation Cage. One that would meet with OH&S requirements, while being simple and practical to use. 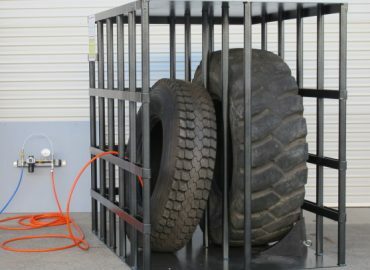 After months of material research and design engineering, our cage was carefully inspected, then blast tested by WorkCover NSW, resulting in Australia’s only fully tested and certified tyre safety inflation cage! RLM went onto develop several certified models, tailored to meet with different workshop requirements; for general automotive, heavy transport, earthmoving and aircraft tyres. RLM-201S Light vehicle - highway transport truck. RLM-201SBM Fully enclosed with blast mesh and door. RLM-201 Heavy truck - Crane - Tractor. 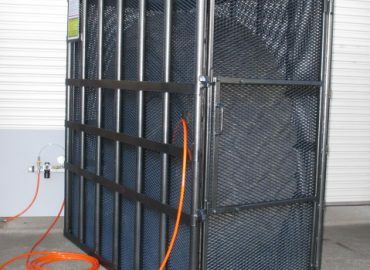 RLM-201BM Fully enclosed with blast mesh and door. RLM-202 Twin bay -: Light / Medium - Heavy truck. RLM-202BM Fully enclosed with blast mesh and doors. RLM-201E Earthmover - 23.5 x 25". 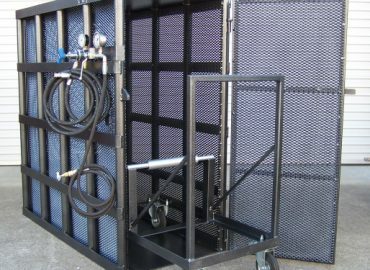 RLM-201EBM Fully enclosed with blast mesh and door. 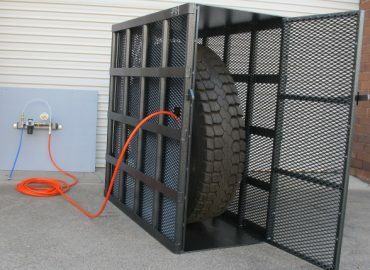 RLM-201H Fully enclosed with blast mesh, For Aircraft Tyres...Nitrogen filled. In 2012. 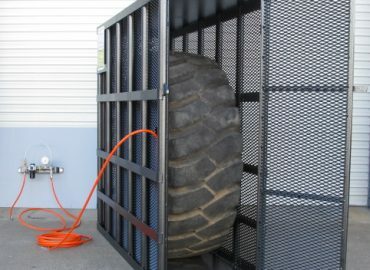 To be certain our cages were compliant with the new Queensland Work Health and Safety Act 2011 and division 5 of the Work Health and Safety Regulation 2011. RLM again set out to test its designs, materials and engineering, by engaging specialist blast force engineers; Australian Technology P/L. to conduct engineering tests, on explosive force separations and sonic velocity effllux, including a finite element analysis ! Resulting with a positive “Certificate Of Assessment” report number S/01/12047. As well we engaged QRMC Risk Management, to conduct an independent risk assessment, to identify any hazards associated with the RLM cage design or operation, also with a positive result. 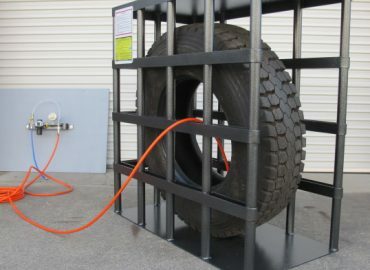 A quality Australia made, tested and certified Tyre Safety Inflation Cage, backed by engineenering tests and documentation, and simple to use.